Madrid turns its residents’ collective passions and intelligence into tangible improvements to city life. New York should do the same. 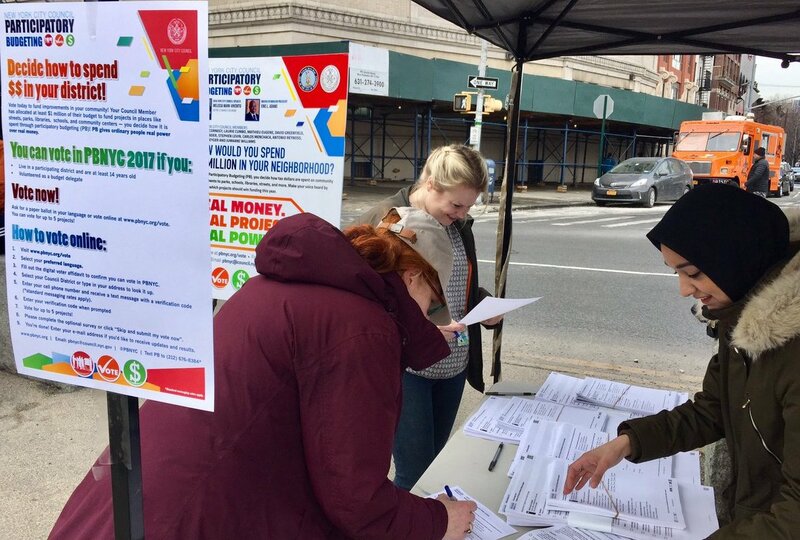 New Yorkers had until February 22 to apply to join the Civic Engagement Commission (CEC), a new entity that city voters approved last election to manage civic engagement processes throughout the city. The commission, which will be officially named in April by a variety of elected officials including the Mayor, has a broad mission and three specific mandates: to improve language access at polling places, expand participatory budgeting citywide, and help nonprofits with civic engagement efforts. Even though these three mandates might seem disjointed, the commission could still be a success. But what does successful civic engagement look like? It looks like Madrid. History won’t explain why Madrid is so good at civic engagement, but Decide Madrid (decide.madrid.es), the city’s official participatory decision-making website, will. Decide is a custom-built, open-source website developed by Madrid’s city council to provide a single online location for the city’s public decision-making processes: participatory budgeting, resident petitions, legislation feedback, and more. By placing all these civic processes into one software platform, Madrid reduces the costs of organizing for government, and streamlines participation for users. Over 400,000 of Madrid’s 3 million residents have accounts, making it the largest system of its kind in the world - and the most impactful. Decisions made on Decide are genuinely important. If a resident’s petition reaches a certain threshold, then the city government is required by law to come up with an implementation plan that will then go up for a city-wide referendum vote. The participatory budgeting projects are funded to the tune of $100 million a year, making it one of the world’s largest participatory budgeting processes. Every comment made on legislation posted to the platform gets a response from a city staffer. 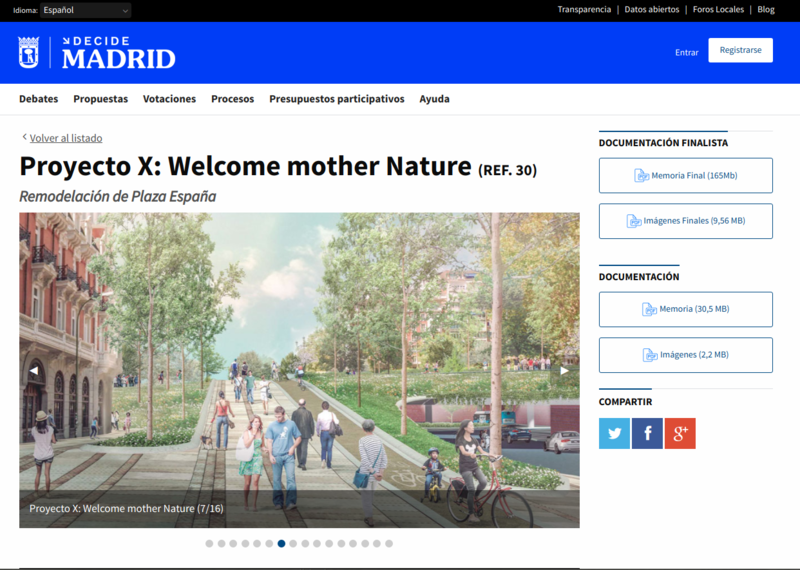 And Madrid is beginning to leverage the system for more complex tasks like decisions related to land-use and public-space renovations. The recent multi-phase process for redevelopment of Plaza Espana, one of the city’s most important public spaces, was a major milestone. The process began with an 18 question survey filled out by over 20,000 people. The results were made public and then used to inform resident proposals, which anyone could post to the website. The public then gave feedback on each proposal via comments, and indicated opinions by clicking a thumbs-up or thumbs-down icon. The most popular projects advanced to the next round where they were evaluated by a jury of experts who worked with the finalists to merge the most popular features into two final proposals, which went up for public referendum where residents picked the winning design. 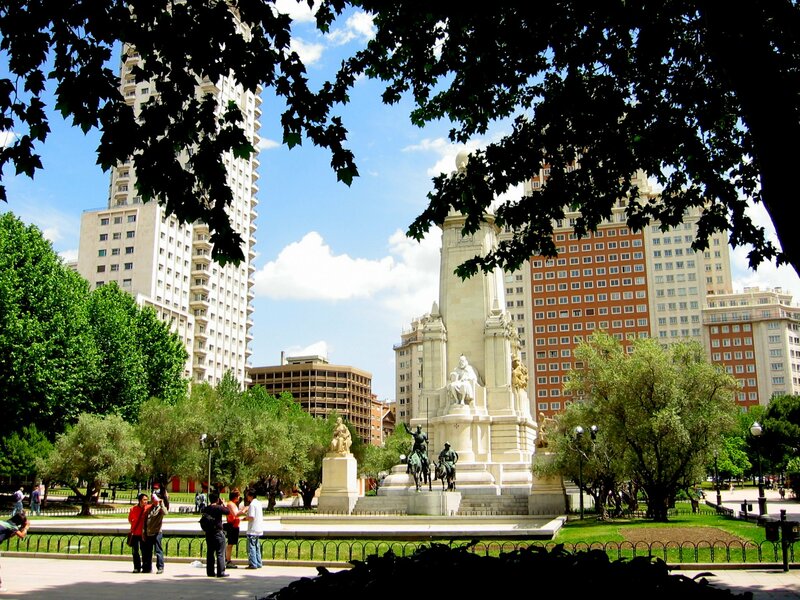 Whether you're looking at big processes like the Plaza Espana redevelopment, or the thousands of resident-generated participatory budgeting project proposals posted to the site for the 2018 funding cycle, one thing is abundantly clear: Madrid has found a way to turn its residents’ passions and intelligence into tangible improvements for the city. And the public loves it. Polls for the upcoming mayoral election show Mayor Manuela Carmena, who made the development and use of Decide a central piece of her first campaign and mayoral administration, is ahead by a wide margin and has never been more popular. The conservatives, who ruled Madrid from 1991 to 2015, are in disarray and the traditional socialist party, which ran against her in the last election, has offered her leadership in their party. She has refused. This leads to an obvious question: is the key to improving the quality of life in a city giving residents the power to make more direct decisions about their government’s actions? Fortunately, Madrid wants us all find out. The software powering Madrid’s Decide website was built by Madrid’s Office of Civic Participation. It turned the code into an open source project called Consul that anyone can download for their own use. And that’s exactly what has happened: over a dozen cities in Spain and nearly 100 governments around the world, including large cities like Buenos Aires and Quito, are using Consul for participatory processes. Software developers in these cities are also contributing code back to the project, enabling Madrid to benefit from the global public’s collective intelligence. And we in New York City can too - but only if we commit to using best practices and open source tools from around the world to do so. Madrid shows us how. We should leverage their success and follow in their footsteps. The soon-to-be-named Civic Engagement Commission that was popularly approved by voters last year is a perfect opportunity. Devin Balkind is the president of Sahana Software Foundation, founder of Sarapis.org, and a former candidate for New York City Public Advocate. He speaks regularly at conferences around the world about using technology to overcome environmental and political crisis. On Twitter @DevinBalkind. Two short days after the November 6 election, Massachusetts adopted cutting-edge legislation (S-2631) that, when implemented, will ensure that every Massachusetts student receives a project-based civics education, equipping them with the skills, knowledge, and dispositions for lifelong civic participation in our 21st century democracy. This legislation, the most substantive civics education bill passed in the country in recent history, may show New York the way forward. Like many states nationwide that are proposing reforms to their civics education standards, Massachusetts may have felt the need to respond to the current civic reckoning. It seems like policymakers may finally realize that one of the potential consequences of deprioritizing civics education in schools is an electorate that does not understand how democracy works or have the civic skills to advocate for systemic change to issues impacting themselves and their community. The lack of civic knowledge and skills has resulted in an electorate that does not actively participate in politics or believe that government is relevant to their daily lives. In one fell swoop, Massachusetts has positioned itself as a model state for effective civics education. New York, which prides itself on being a state that sets national legislative and policy trends, should take note. To contextualize the current state of New York’s democracy and why civics education is needed “now more than ever,” the state has historically ranked at the bottom of the national voter turnout list. That’s why it’s so impressive that almost 50 percent of registered New York voters cast a ballot on November 6. According to the Journal News, this year was the “highest turnout for a midterm election in almost a quarter-century.” Compare that to turnout in 2014 when only 33 percent of New Yorkers cast a ballot in the midterms. Part of the reason for our state’s historic, low voter turnout is our antiquated voting laws. New York requires voters to register 25 days before the election, they cannot register to vote online unless they have a DMV-issued identification, 16- and 17-year-olds are not allowed to pre-register to vote when they obtain said DMV-issued identification, and New Yorkers cannot vote early - unlike voters in 37 states. One can only hope that the new leadership in the state Legislature can bring our voting laws into the 21st century to address some of the root causes of our participation problem. But another root cause for New York’s low voter turnout is that the state isn’t effectively educating young people for civic participation. To be fair, New York already mandates that all students take Participation in Government (also known as PIG), a one-semester civics education course, before graduating from high school. On its face PIG should do the trick as the course is intended to provide students with “opportunities to become engaged in the political process by acquiring the knowledge and practicing the skills necessary for active citizenship.” The reality is that while PIG is aligned with principles of Action Civics on paper, PIG as implemented falls short. Action Civics is a 21st-century civics education pedagogy that is a student-centered, project-based approach to develop the individual skills, knowledge, and dispositions necessary for 21st-century democratic practice. As implemented, PIG does not educate students about local democratic structure, help them learn about processes by engaging in those processes, or how to research, analyze, propose, debate, and advocate for their collectively determined solution(s). By and large, PIG as implemented is civics as usual, a largely passive form of learning that is often a senior year after-thought based on rote memorization of random government facts. Teaching civics well requires robust professional development and curricular resources from the state. Even if teachers wanted to teach PIG as intended, many are not provided the resources or training necessary to do so effectively. There are very few resources or professional development courses designed to equip educators to navigate the discussion and debate of community issues or local democratic structures, and implement nonpartisan, student-led project-based learning in the classroom. There’s also no accountability system in place to ensure teachers measure student learning and ensure that their students develop the civic knowledge, skills, and dispositions necessary for lifelong civic participation in our 21st century democracy. The takeaway is that PIG is being implemented haphazardly and inconsistently statewide. The fact that PIG is being implemented inconsistently only further widens the Civic Engagement Gap plaguing underserved school districts statewide. The reality is that students from rural and low socioeconomic urban communities are 50 percent less likely to study how laws are made, and 30 percent less likely to report having experiences with deliberative discussions in their classes. Fortunately, all is not lost. The New York State Education Department (NYSED) made a commitment to modernizing New York’s civics standards when they added the College, Career and Civic Readiness Index (CCCRI) and created a graduation “seal of civic engagement” in the state’s plan to comply with the federal Every Student Succeeds Act. 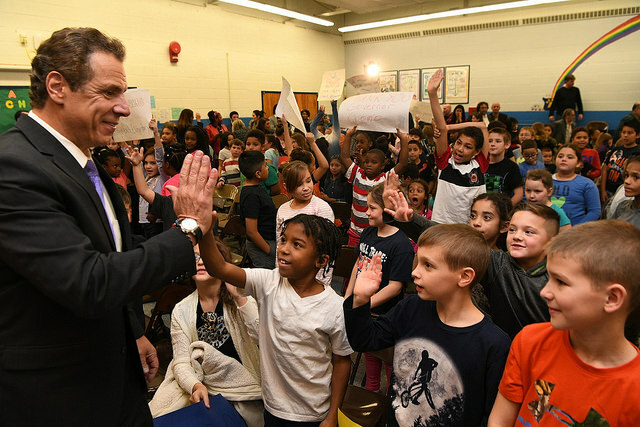 While the CCCRI establishes a baseline for holding schools accountable for ensuring students’ civic readiness, NYSED has yet to define “civic readiness.” NYSED also needs to define the criteria for how students can earn the seal of civic engagement and then ensure that every student is granted meaningful opportunities to achieve it. As a member of a task force NYSED recently established to propose recommendations about how to define civic readiness and the criteria for the seal of civic engagement, I will advocate for a robust civics education for every student in New York. It is incumbent upon us as a state to follow the lead of Massachusetts and others in adopting a rigorous definition of civic readiness and investing in professional development to prepare educators to teach modernized civics standards. Most importantly, NYSED must distribute funding equitably to districts, prioritizing those with greatest need to help them implement new mandates. Doing so would help strengthen New York’s democracy by ensuring that more New Yorkers have the knowledge and skills necessary to participate in our 21st-century democracy; and hopefully vote in all elections. Anything less would only widen the Civic Engagement Gap. DeNora Getachew, New York City Executive Director of Generation Citizen. On Twitter @DeNoraGetachew & @GenCitizen. On Election Day -- Tuesday, November 6 -- New Yorkers have a unique opportunity to vote for democracy. By voting “yes” on three ballot proposals, we can turn New York City into a beacon for democracy. The ballot proposals will make it easier for ordinary New Yorkers to run for office, vote in elections, have a say in city decisions, and serve on community boards. They will make our government better and our voices stronger. Proposal 2 is especially powerful. It will create a Civic Engagement Commission, dedicated to building a more participatory democracy, one that extends beyond any election day. By investing in civic engagement, we can create space for millions of residents to get more involved, step up as leaders, and help make decisions. The Commission would create a citywide participatory budgeting (PB) program, giving New Yorkers a greater say in how our how tax dollars are spent. Through PB, residents brainstorm spending ideas, turn these ideas into proposals for a ballot, and then vote to decide which proposals get funded. In New York City Council’s PB program, 100,000 people have decided how to spend around $40 million per year. Residents - including non-citizens and people as young as 11 years old - have developed and approved hundreds of improvements to public schools, parks, streets, libraries, hospitals, and housing. Voters have been more representative of the city than in local elections, with low-income people, women, and people of color participating at higher rates. This engagement has broad and long-lasting impacts on our democracy. Years of PB proposals for school air conditioning and bathroom repairs sparked city-wide campaigns, which won $180 million to install air conditioning and fix bathrooms at schools across the city. PB has turned hundreds of residents into community leaders, boosting their civic skills and knowledge. It even increases electoral turnout, making people 7% more likely to vote in other elections. The charter revision would build on this success, allowing more people to make bigger decisions. Other global leaders in democracy, such as Paris and Madrid, have successfully launched similar programs. In Paris, Mayor Anne Hidalgo has committed 500 million Euros for residents to allocate - for school, district, and citywide projects. In Madrid, the city launched citywide PB and an office of participation, and 400,000 people have gotten involved (in a city not much bigger than Brooklyn). In New York, PB voters consistently tell us that they want to make bigger decisions. City Council members and their staff tell us that they need more resources and support to engage their communities. Proposal 2 will do both. The Civic Engagement Commission will be an opportunity for us all to shape the city’s future. While city agencies typically only report to the Mayor, in this case the Mayor, City Council Speaker, and Borough Presidents will each appoint Commission members. The ballot proposal also requires the Commission to partner with community organizations. The Commission will not be perfect (what institution is? ), but it will make our city better, by inviting neighbors to decide how their tax dollars are spent and providing more staff support and resources for civic engagement. If we want to fix our democracy, we need to expand how people can participate. Vote yes on November 6 to show your support for our democracy. The charter revision commission convened by Mayor Bill de Blasio held its fourth and final issue-focused forum on Thursday afternoon at NYU, hearing testimony from experts on the city’s civic engagement efforts and hearing proposals for independent redistricting of City Council districts. The central question before the commission on civic engagement was whether the city should create a new independent, nonpartisan Office of Civic Engagement. The proposal is the brainchild of New York City Council Member Brad Lander, a Brooklyn Democrat, who was among those who testified Thursday. If the commission decides to take up that and other proposals heard at previous hearings, they would be presented to voters as ballot referenda in November. The three previous issue-focused expert hearings were on voting and elections; campaign finance reform; and community boards and land use. Panellists who spoke before the commission on Thursday sought to define civic engagement, its limits and challenges, and the mechanisms by which it is currently carried out by city agencies, nonprofit organizations, and community-based advocates, and comprehensive approaches to combining all those disparate elements. Naomi Zauderer, chair of the NYC Voter Assistance Advisory Committee, informed the commission about VAAC’s continuing voter engagement and registration efforts, acknowledging a fact that the commissioners were familiar with: the city’s abysmally low voter turnout in recent elections. “[T]he real challenge in New York City is getting people to turn out to the polls,” she said, noting that a lack of information about elections and candidates serves to discourage voters. Paula Gavin, chief service officer of NYC Service, the city agency charged with encouraging volunteering efforts, said a big challenge is New York City’s low volunteering rate -- only 14 percent, compared with the national average of 25 percent. She said increasing the city’s volunteering and civic participation rate through a “continuum” of agencies and elected officials working together with community-based organizations would also lead to an uptick in turnout. “It is shown that those who volunteer more, vote more. Those who vote more, volunteer more. So the tide will rise,” she said. But Zauderer and Amy Loprest, executive director of the Campaign Finance Board, where VAAC operates, said voter engagement should continue to be housed under the CFB, which already has a well-established voter information and outreach operation that continues to be improved. They agreed that an Office of Civic Engagement is a laudable idea, but one that should coordinate with the VAAC’s existing efforts rather than subsume its role. “I think we would support the idea that...any organization that’s called an Office of Civic Engagement be a nonpartisan and independent agency, because I think that insulates it from any kind of political pressures or the desire to follow any particular person’s priorities,” Loprest said. Beyond the framework, panellists also pointed out blind spots in current civic engagement efforts that they said should be avoided under a newly empanelled agency. Underserved populations -- such as the disabled, low- and moderate-income communities of color, immigrants -- tend to be ignored by civic institutions, they said. Others stressed the need to inculcate a sense of civic duty in New Yorkers, particularly by starting at an early age in the city’s schools. DeNora Getachew, New York executive director of Generation Citizen, a civics education provider, urged an emphasis on “action civics,” ensuring that young people can actually use the civic knowledge they’re given to enact change in their communities. “We know that too much emphasis is placed on voting as a way to be civically engaged and, rather, there is a spectrum of civic engagement opportunities that we need to be presenting to young people and also to adults,” she said. Getachew urged the commission to consider the OCE proposal, among other things, including allowing 16- and 17-year-olds to vote in municipal elections and providing more government jobs to young people in city employment programs. 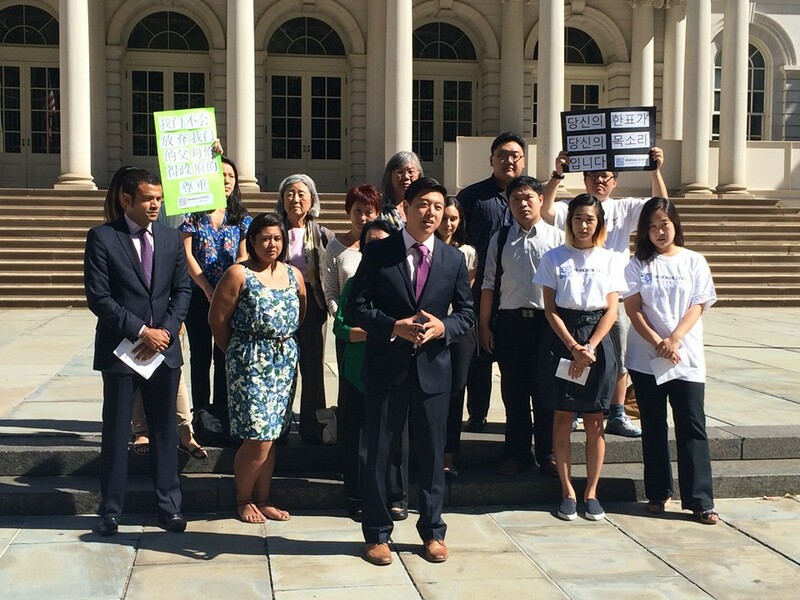 “It’s a two-way street,” said Elizabeth OuYang, a civil rights attorney and member of OCA-NY Asian Pacific American Advocates, insisting that immigrant communities are eager to contribute to the city’s civic life but must see their efforts reciprocated by city government. “If you’re to encourage volunteerism in the immigrant community, it has to be a comprehensive strategy that also includes their involvement in democratic policy decision-making.” The city’s outreach, she said, should occur through existing networks of religious institutions and neighborhood groups that immigrants trust. Ifeoma Ike, founding partner of Think Rubix, a civic-action oriented think tank, echoed a similar point of caution, stressing the need for equitable, culturally relevant and ongoing outreach to communities of color, and not a “transactional” approach centered around an election that arrives every four years. “We must not dismiss these communities as apathetic,” she said. Another significant issue that has long been ignored, said Susan Dooha, executive director of the Center for Independence of the Disabled in New York, is the city’s lack of disability access, which affects everything from voting and civic participation to employment and housing affordability. “We find retrofitting efforts with accessibility concerns after the fact is a poor way of accomplishing inclusion,” she said of the city’s civic engagement efforts, emphasizing the need for disability literacy training and early phase consultation with disability advocates. “[P]eople with disabilities feel that they’re being made invisible, We want to go out and vote in a public space like our neighbors because we want to be seen,” she later said, noting that the disabled community faces particular obstacles in accessing polling sites. “It’s terrible to tell people they have a duty to do something that you then prevent them from doing,” she said. Noel HIdalgo, executive director of BetaNYC, a civic technology organization, said the OCE could be a “digital steward” for new government services initiatives that he said should be designed in consultation with the people they are serving. He pushed for digital literacy programs, improving the city’s technology infrastructure starting at the community board level, something BetaNYC has been doing with Manhattan Borough President Gale Brewer, and for an enhanced participatory budgeting system that employs technology that is broadly accessible. Though most commissioners asked about how the OCE would work, only one commissioner, John Siegal, questioned why it was necessary. “I’m worried that if we do this...that it will atrophy,” he said, speculating that it would be left to the whims of each subsequent mayor. Siegal also struck a skeptical tone as he noted that none of the panellists had spoken to the role of the private sector in improving civic engagement. Though civic engagement dominated most of the forum, the other focus issue, and one with a looming challenge, concluded its agenda: independent redistricting. The City Council’s 51 districts are redrawn every ten years after the federal census, which is due to take place in 2020. Currently, law stipulates that the mayor appoints seven members to a city districting commission and the City Council appoints eight members. The charter commission may propose changes to the system. John Flateau, a professor at Medgar Evers College and a New York City Board of Elections commissioner, made a slew of suggestions at Thursday’s forum. He said the city could create as many as 70 Council districts of smaller sizes and stressed the need for proportional representation for the five boroughs based on populations. Flateau and other panellists cited California redistricting model as one the city could follow, which prohibits incumbent elected officials from sitting on a redistricting commission and invites applications that are independently screened. “Think of redistricting...that could be one of those triggers, one of those mass civic engagement exercises, figuring out how to set up this process going forward so that individuals, communities, neighborhoods feel ownership for wanting to participate in this process and learn more about their government,” he said. Kathay Feng, executive director of California Common Cause, testified on a video call to the commission. Among other ideas, she said there could be a robust list of conflicts of interest to limit who could serve on a redistricting commission, that districting commission members should be diverse and could be picked based on a set of qualifications, with the goal of ensuring the maximum public confidence in how maps are drawn. An application process like California’s, she said, would ensure that a commission attracts participants who are willing to commit their time to a laborious process. And she emphasized several transparency measures a commission should follow. Flateau and the others did warn that any efforts at independent and equitable redistricting would be predicated on an accurate count in the 2020 census, which is threatened by the Trump Administration’s decision to include a citizenship question that could depress the count in immigrant communities. He also said that previous commissions fell under the preclearance mechanism of Section 5 of the Voting Rights Act -- where the federal government would first approve any changes to local voting districts -- which was struck down by the Supreme Court in its 2013 decision in Shelby County v. Holder. In its absence, Flateau said the city could possibly set up its own preclearance system for municipal districts under the corporation counsel’s office. James Hong, the former co-director of the MinKwon Center for Community Action, agreed that applicants should be screened and ideally, the commission would be made of “academics, demographers, people who are really into data and connected with their community, and community members,” and would prohibit past elected officials from serving. “Redistricting from start to finish needs to be protected from partisan operatives,” he said. Over the next month, the charter commission will hold another round of public hearings across the city. The commission’s proposals are due by September 7.